About 37% of healthy adults do not have a gag reflex at all according to a study published in the Lancet . If you’ve ever attended a college fraternity party, you’ve likely seem this demonstrated first hand. You know, the fraternity brother who is able to drink down an entire beer in a single gulp! On the other hand, 10-15% of people have a hypersensitive gag reflex which can lead to fear of the dentist, difficulty eating sticky foods and even picking eating and malnourishment in the most severe of cases. One of my sisters has a hypersensitive gag reflex which even caused her difficulties when brushing her teeth while we were growing up. The good news is that this bothersome reflex can be turned off temporarily using acupressure. Acupressure is a technique used in alternative medicine very similar to acupuncture. While acupuncture employs needles to stimulate pressure points on the body, acupressure uses gentle to firm finger pressure making it ideal for self treatment where and when necessary. Developed in Asia over 5,000 years ago, acupressure is dismissed as an irrational and dubious practice by conventional medicine. Yet, if you have ever used it yourself, you have probably experienced how gentle and effective acupressure can be. The techniques can be used over and over again as needed to relieve pain and enhance relaxation. Acupuncture to induce labor works too! I have personally used acupressure to prevent seasickness for over 20 years whenever I travel or vacation by boat. I’ve used the same technique to prevent carsickness and airsickness in my children when necessary. One of the most frequent emails I receive is from parents who have trouble giving their children a daily dose of cod liver oil. Some children have quite a severe gag reflex when they take it. It can leave a big mess on the floor over and over again. Cod liver oil is arguably the most important food based supplement you can provide your family to boost immunity. It is indispensable for keeping the family off antibiotics when illness (infrequently ) strikes. Resolving the gag reflex that is preventing a child from taking it is very important! In the video below, I demonstrate exactly how to use acupressure to your advantage to temporarily halt the gag reflex to enable your family to take their fermented cod liver oil with no gagging and no mess. While there are a number of acupressure points that can assist with shutting down the gag reflex, there is one that by far is the easiest for children (or you!) to perform. 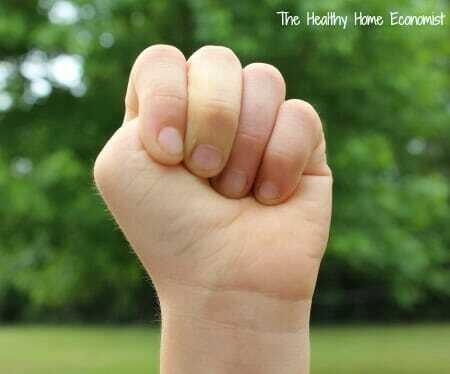 Make a tight fist with your left hand with the thumb inside and hold it for a few seconds. The picture above shows you exactly what to do. What if You’ve Already Started to Gag? This acupressure technique will even work if your gag reflex has already been stimulated and your child is starting to gag. Just quickly do what I show you below and the gag reflex will magically turn off! In our family’s experience, the gag reflex is turned off for about 30 seconds when this acupressure technique is employed. My husband used this technique this morning which is what gave me the idea for this post. He really enjoys ultra strong tasting homemade kefir that is fermented for several days on the counter. The kefir is so strong tasting in fact that if you drink it too quickly, you will gag! He drank a little too fast this morning and felt the gag reflex coming on. Using this acupressure technique, saved himself from what promised to be a highly unpleasant experience! Do you have another acupressure technique that you’ve tried that temporarily blocks the gag reflex? Please share in the comments section. This video below demonstrates what to do to temporarily halt the gag reflex. It is particularly effective should you need to swallow some pills or brush your teeth. You can also hold your hand in this position while in the dental chair to reduce gagging during tooth cleanings. Why Does Making A Fist Stop Gagging?